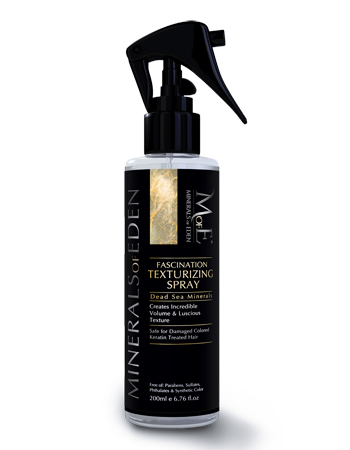 Fascination Texturing Spray works hard to create volume, bounce and texture to your hair so you don’t have to. Utilizing the mineral-rich salt from the Dead-Sea, this spray will effortlessly make your hair voluminous, and the nourishing oils of jojoba, linseed and olive will keep your hair looking healthy and luscious all day – and night. This extraordinary texturing spray can be used both on wet, pre-styled hair and on dried, styled hair, depending on your desired look. Water (Aqua), Amodimethicone, Trideceth-12, Cetrimonium Chloride, Ethyltrimonium Chloride Methacrylate, Hydrolyzed Wheat Protein Copolymer, Polysorbate 20, Phenoxyethanol, Ethylhexylglycerin, Sea Salt (Maris Sal), Fragrance (Parfum), Olea Europaea (Olive) Fruit Oil, Linum Usitatissimum (Linseed) Seed Oil, Macadamia Ternifolia Seed Oil, Prunus Persica (Peach) Kernel Oil, Simmondsia Chinensis (Jojoba) Seed Oil. Apply Texturizing spray on damp hair from above the roots until the tips of the Hair strand, section by section before blow drying to achieve most volume. Can also be applied after blow dry by spraying in section from above the roots and running your fingers through the Hair towards the tips. Do not swallow. Keep out of reach of children. Cosmetic product should be used only for the purpose it is intended and in accordance with the purposes of use. Avoid contact with eyes. Discontinue use as soon as signs of irritation appear. If sensitive to any of the components do not use the product. Not for use on babies.